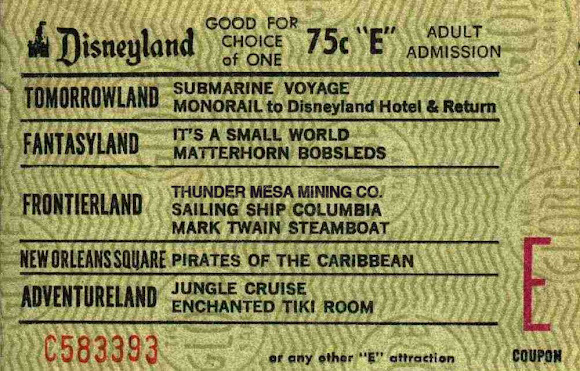 Please have your "E" coupon ready and hand it to the friendly conductor before boarding. 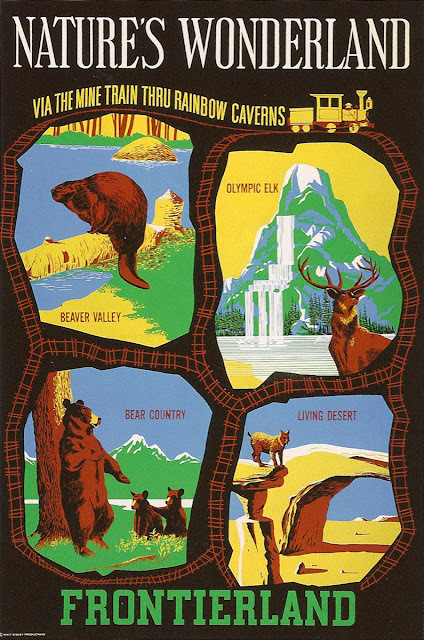 Classic Disneyland attraction poster for the Mine Train Thru Nature's Wonderland. Today we're going to take a break from modeling on Thunder Mesa and step into the Wayback Machine for a visit to one of the primary inspirations for the TMMC, Disneyland's Mine Train Thru Nature's Wonderland. 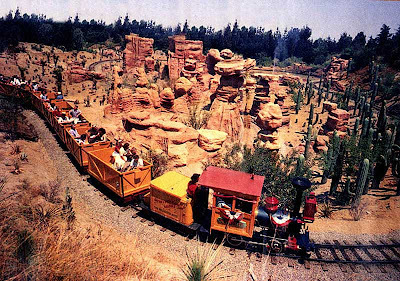 As a kid growing up in Orange County in the 60s and 70s, the old Mine Train ride was my very favorite thing at Walt's original Magic Kingdom. 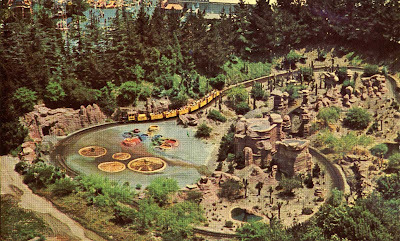 I've referenced the ride many times on this blog so it's high time to relay the story of this fascinating extinct attraction. 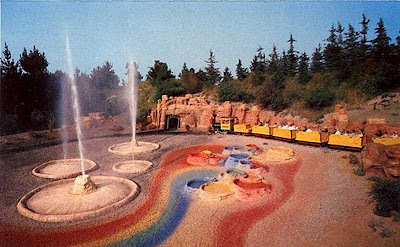 The original Rainbow Caverns Mine Train opened at Disneyland on July 2, 1957. 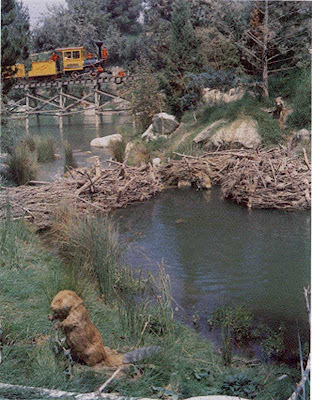 Like Adventureland's Jungle River Cruise, the Mine Train played off of Walt Disney's popular True Life Adventure series of nature films. One film in particular, The Living Desert, was a major source of inspiration. 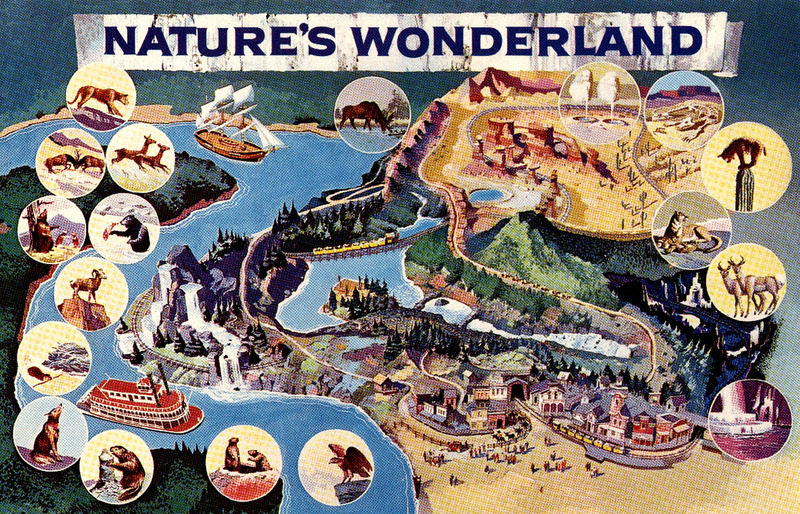 This wonderful artwork was used to introduce the updated attraction to guests before it reopened in 1960. © Disney. 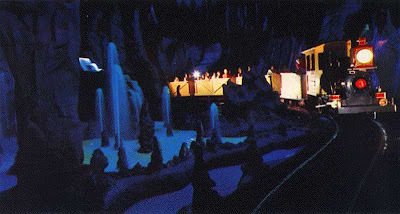 A little less than three years after the Rainbow Caverns Mine Train opened, it was almost completely redone in a major upgrade and expansion. Nearly 2 million dollars were spent "plussing" and expanding the ride with over 200 Audio-Animatronic animals, a longer track plan and several dramatic new scenes. 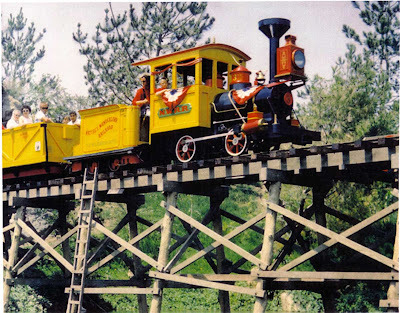 The original, 30" gauge, steam-outline battery operated locomotives and their trains were repainted a bright yellow, replacing an earlier dark green scheme, and the entire attraction was relaunched as the Mine Train Thru Nature's Wonderland in June of 1960. This great vintage look poster was used to announce the opening of Nature's Wonderland in 1960. © Disney. Elevation drawing for Cascade Peak, one of the new "natural" wonders in Nature's Wonderland. © Disney. 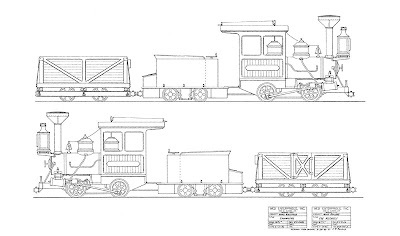 WED Enterprises (WDI) elevation drawing for the Disneyland Mine Train. The 30" gauge trains were battery operated, each pulling seven cars with a maximum capacity of 74 guests per trip. © Disney. A dream team of first generation Imagineers was assembled to bring the project to life. 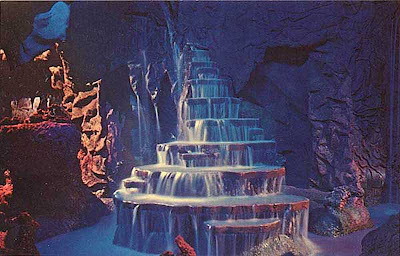 Roger Broggie, Sam McKim, Bob Sewell, Bill Martin, Bob Mattey, Wathel Rogers and Vic Greene joined Claude Coats, creator of the amazing colored water effects in Rainbow Caverns, to design, engineer and build Walt's natural wonderland. The final result was like a trip through America's great National Parks, served up with a generous salting of Disney humor and whimsy. 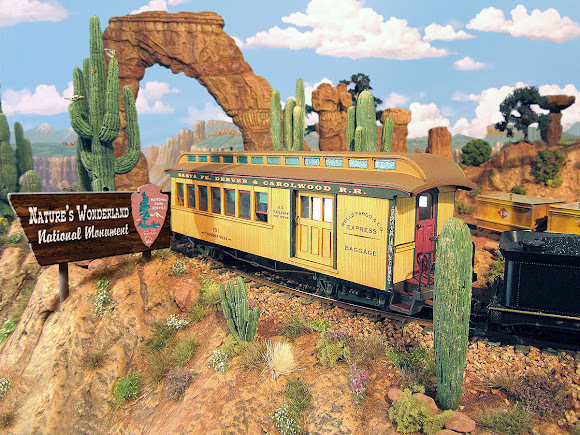 A new, recorded narration was provided by character actor and Disney favorite Dallas McKennon, describing the amazing sites along the way and adding a charming, rustic touch to the ride. The Living Desert and Rainbow Caverns were still there, but the expanded track loop now included the sites of Beaver Valley, Cascade Peak and Bear Country; all inspired by the True Life Adventure series of films. 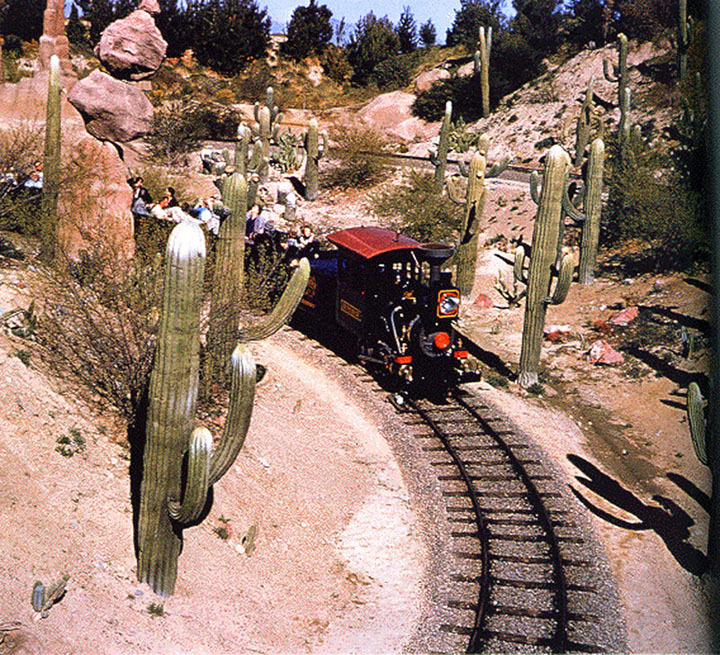 Let's take a ride now on the Mine Train Thru Nature's Wonderland, just as it was back in the mid 1960s. Howdy folks! Welcome to the little minin' town of Rainbow Ridge, gateway to Nature's Wonderland. Please stay seated at all times, and keep your hands and arms inside the train. The animals get mighty hungry! It sometimes gets pretty wet up ahead, folks. 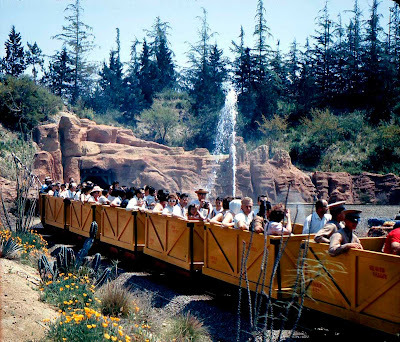 The rushing waterfalls crossing the tracks come from Cascade Peak to your right, the highest point in Frontierland. Don't worry though, everything will be okay, unless the wind changes... then we could all get a shower! Now folks, I don't wanna scare you on this old rickety trestle, but everybody sit real still.. no tellin' how long she's gonna last! We're comin' into Bear Country now, folks... Yuh know bears are one of the most playful animals there is. Lazy too. All they want to do is lay around 'n scratch, 'n fish, 'n swim... that is when they ain't sleepin'. Ahead now is the Natural Arch Bridge, carved out of solid rock after hundreds of thousands of years of wind, rain, snow and sleet... and a little help from Walt Disney! Yuh kin see the great Living Desert down below. Yuh know, the desert's a dry place, n' full of some purty mean varmints! You gotta be careful of sidewinders, wild pigs n' even mountain lions. Ahead of us is the saguaro cactus forest, home of the 'skyscraper of the desert.' The heat out here sometimes affects our passengers. They think some of these cactus look like people and animals. Somebody even saw the Seven Dwarves out here yesterday! Saguaros are the desert's biggest living things, and they provide homes for all kinds of birds. Say, ever hear of the Devil's Paint Pots? Real mystery of the desert... bubblin' pots of mud in all kinds of colors. This here's geyser country too.. uh oh! There she blows! Sure glad you all brought yer raincoats. Look out now! We never know when she's gonna go off. That's why we call her 'Old Unfaithful.' Look out now! Hey, you folks in the last cars better be ready... she's a threatanin' agin! Yuh, know, I hear a long time ago dinosaurs roamed this area. 'Course all yuh find now is cactus, snakes 'n coyotes... And sometimes the sun-bleached bones of an ancient animal. We're now comin' into Balancing Rock Canyon. Keep a sharp eye out 'cause sometimes an unwary animal gets caught on top of one of those unsteady rocks and... Look out for that bobcat! He's fallin toward the train... Watch out! That was a close one! 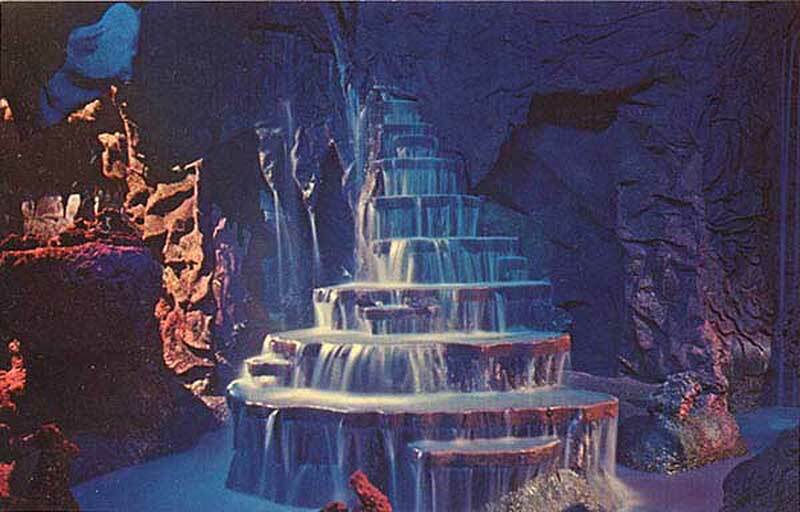 Rainbow Caverns was the amazing two minute dark ride finale of Nature's Wonderland. 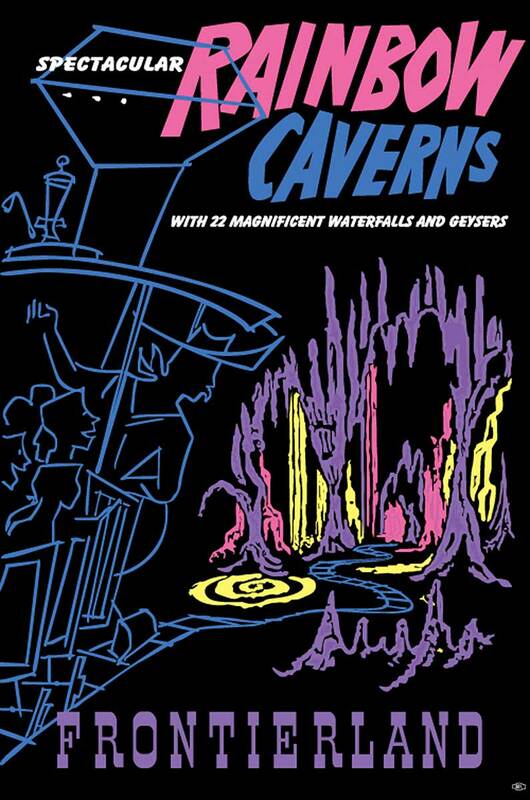 Largely unchanged from its original 1956 version, the Claude Coats designed caverns featured remarkable flowing water effects using ultra-violet light and dye-tinted waters. 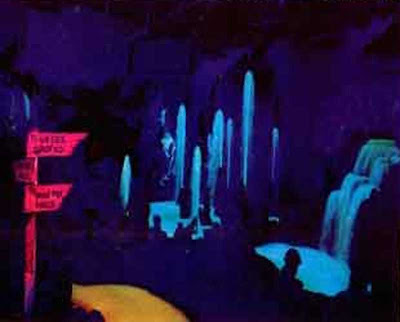 The black light effects were dazzling but almost impossible to photograph with the technology of the times. As a result, very few photos exist from inside the caverns. There were indeed 22 magnificent waterfalls and geysers. 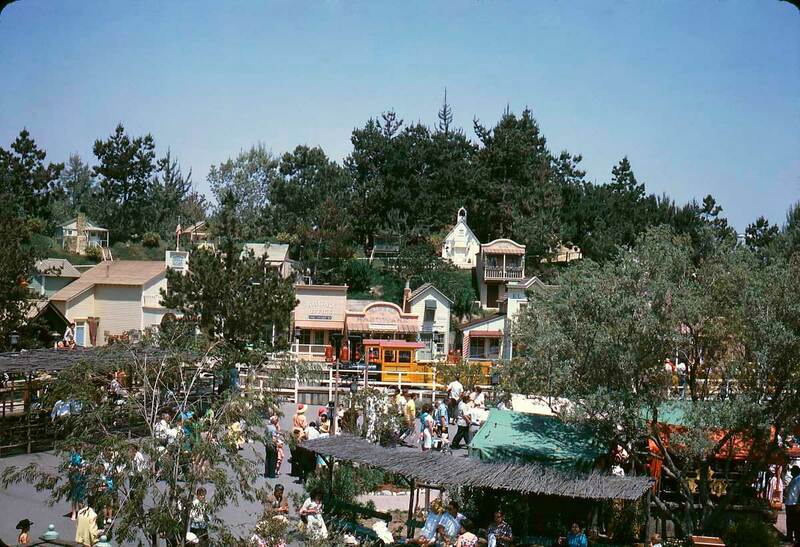 Then it's back into the blazing California sunshine as your train emerges from the tunnel completing the circuit back to Rainbow Ridge. 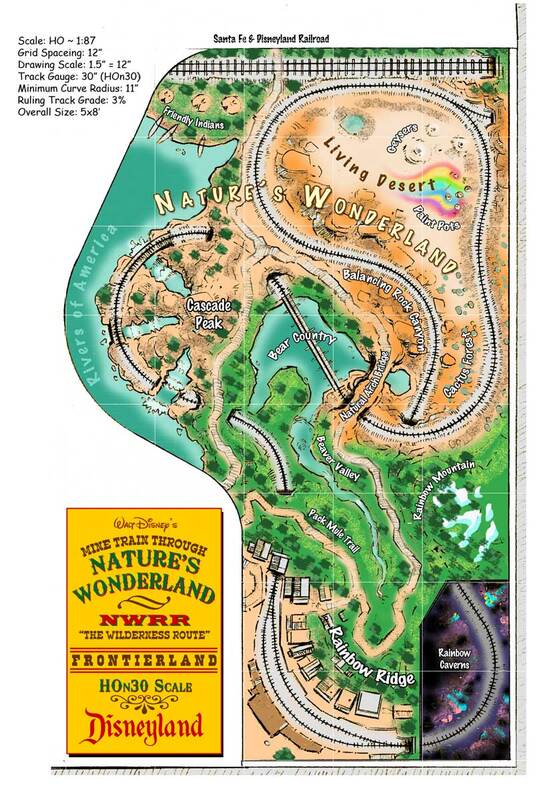 We hope you have enjoyed your trip into Nature's Wonderland. Please remain seated until the train comes to a complete stop. Lift the jump seat in the middle of the car and the door will automatically come open. Thank you for joining us! The Mine Train Thru Nature's Wonderland operated daily at Disneyland from June 1960 until New Years Day, 1977. 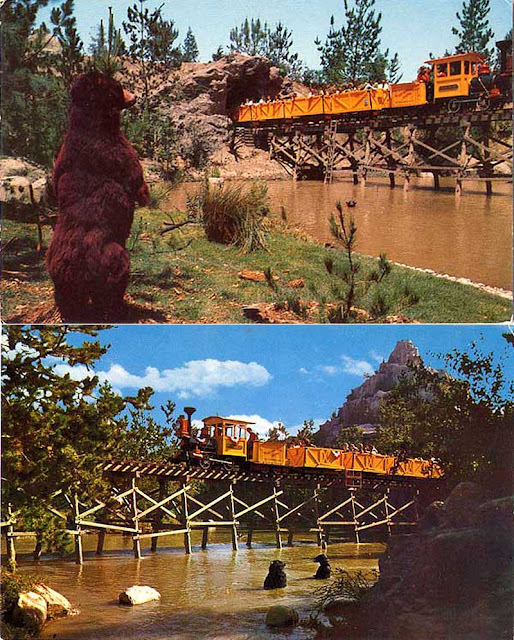 The attraction was demolished to make way for a new mine train themed roller coster attraction called Big Thunder Mountain Railroad which opened in the summer of 1979. Declining ridership and changing public tastes are the reasons most often sited for the change. 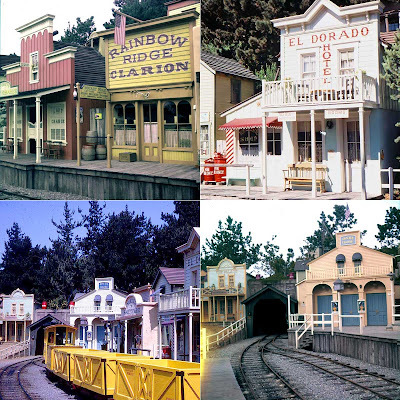 Some of the Rainbow Ridge structures were saved and relocated in the new boomtown of Big Thunder (often still called Rainbow Ridge by those both inside and outside the Mouse). A tribute to the Rainbow Caverns section of the ride was created on the first lift hill of BTMRR but the effects are achieved in a different and less spectacular fashion. Some other bits and pieces of Nature's Wonderland still survive in the north end of Frontierland, mostly in the form of rock formations and old tunnel portals along the Big Thunder Trail and at Big Thunder Ranch. 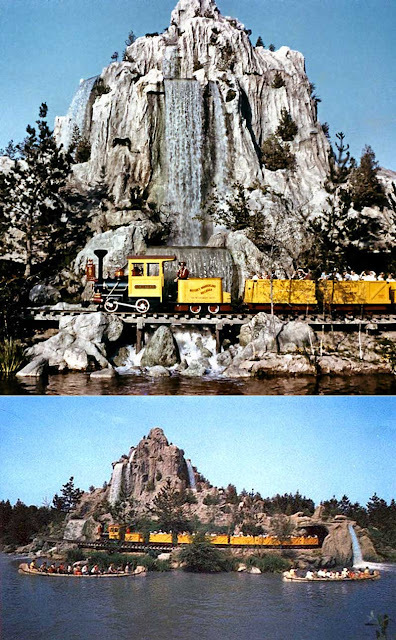 Cascade Peak survived the end of the Mine Train for many years, continuing to roar and recycle the green-tinted water of the River's of America. It finally succumbed to old age and a lack of regular maintenance and was completely demolished in 1998. Before embarking on my adventures in Thunder Mesa Country I had seriously considered building a model railroad that more exactly recreated the Mine Train Thru Nature's Wonderland. I created two plans for a model, one in On30 and another in tiny HOn30 (HO scale 1:87 trains running on 9mm N gauge track). The HOn30 plan was by far the best and I offer it up here, free of charge, to anyone who might wish to build their own version of Nature's Wonderland. Most of the information in this post came from issue 29 of The "E" Ticket magazine, now, sadly, out of print. Additional sources of information are yesterland.com, davelandweb.com, and gorillasdontblog.blogspot.com. The rest is from my sometimes faulty memory. Any errors are all mine. Hope you enjoyed this trip back in time to Nature's Wonderland. Memories of that long missed attraction continue to inspire and inform my modeling to this day. Adios 'till next time! Testing the waters (so to speak) with a temporary trestle bent. This was built to see if a bridge using lighter 8" x 8" posts would be convincing in the scene. 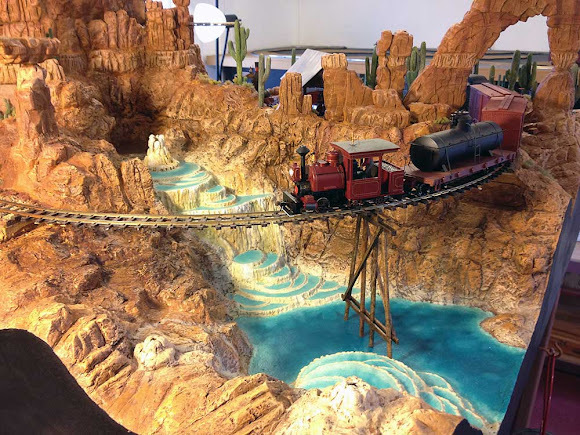 It's always exciting when trains cross over water and as Geyser Gulch is such a focal point on the layout it will require a very special bridge. Coming up with a pleasing design was a bit of a challenge since I want a wooden bridge but at the same time don't want it to obscure or distract from the scenery in the Gulch. Then there are the purely logistical problems of engineering a trestle for a tight 15" radius curve while trying to make something that might be believable in the real world. I want something light and airy looking, but also sturdy. I'm no bridge expert, but with the valuable help and advice of fellow modelers at the On30 Railroad Line Forum I was able to narrow many options down to a final design. My first design decision was to use scale 8" x 8" timbers for the posts and sills instead of the more prototypical 12" x 12"s. This reduces the "visual mass" of the bridge right away and gives a nice spindly look to the bents. The next decision was to reduce the angle of the outside posts to just 7º, adding to the tall, narrow look. Next I opted for a rather unusual king post truss arrangement between the bents instead of the usual straight stringers which will allow for a wider spacing of the bents than would otherwise be possible on such a tight curve. This arrangement is modeled after a bridge in Franklin New Hampshire and should make for a beautiful and graceful looking trestle. 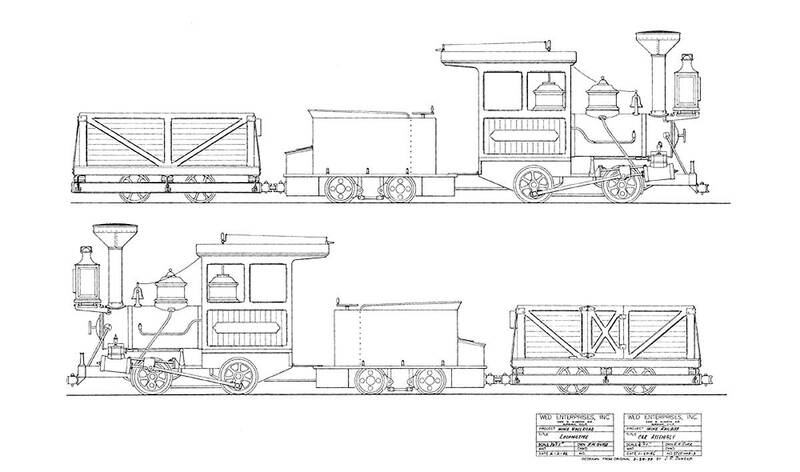 The final design decision was the toughest to make. The question of whether to use round piles driven into the stream bed or square timbers on footings. I started out with a pile trestle very firmly in mind; creosoted timbers sitting right in the water, encrusted with travertine and slowly rotting away. 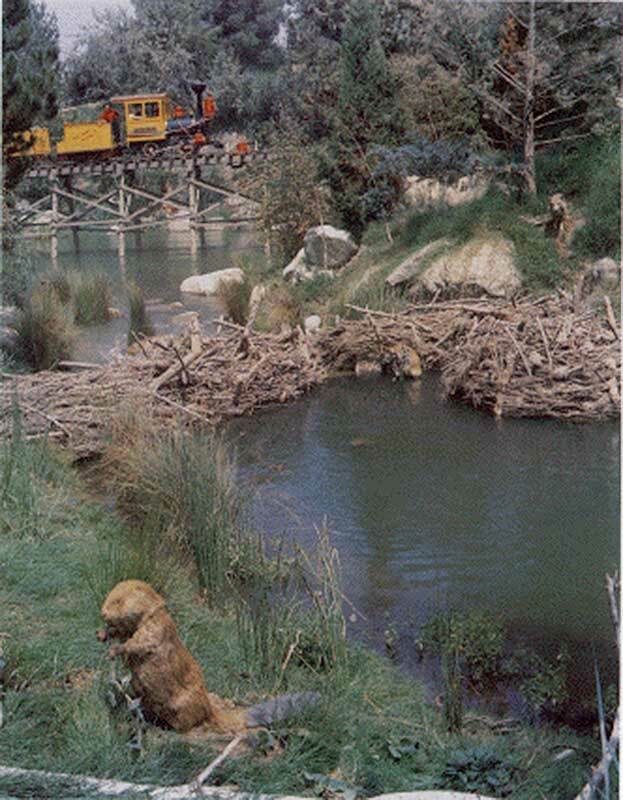 Of course, placing wooden timbers directly into water is never a good option and most railroads avoided it whenever possible. It might be cheeper in the short run to use a pile driver and smash the posts into the stream bed, but it would be a temporary solution at best. It really comes down to which construction method was more likely to have been used "back in the day" when the railroad was first constructed. Finally I decided that since the TMMC was once a rather well off little railroad, the brass hats would have spent the money to build the bridge right the first time with stone or concrete footings keeping the bents above water level. But the clincher was a purely aesthetic decision. 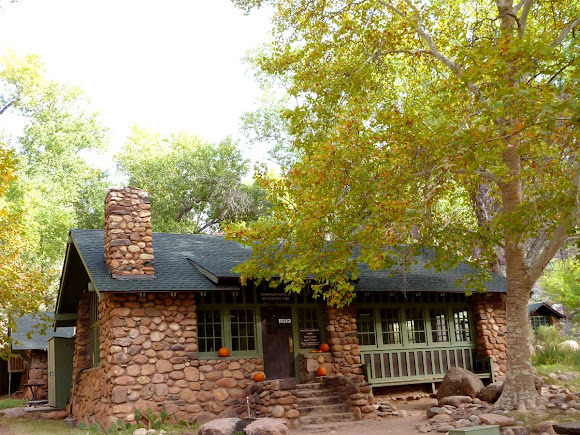 I have always been a great admirer of National Park architecture, particularly the native wood and stone buildings of Mary Elizabeth Colter at Grand Canyon and other southwestern parks. Since Nature's Wonderland shares so much in common with our National Parks, it finally occurred to me that what I really wanted was a bridge that looked like it might have been designed by Mary Colter. Phantom Ranch Canteen, Grand Canyon National Park. Designed by Mary Elizabeth Jane Colter. So, my solution is to build a bridge that will compliment and reflect its surroundings, rather than detract from them, using local Ponderosa Pine timbers from the top of the Mesa and local sandstone for the footings and abutments. 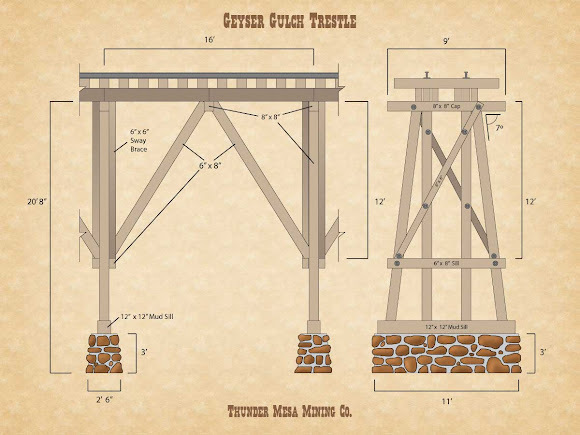 Mixing light and airy construction with sturdy stone piers, this design will require only three bents to cross the water at Geyser Gulch. It will be supported with a stone abutment on the right and a short stone approach bridge on the left side. I'm pretty pleased with this design. Hopefully it will make for a beautiful, graceful bridge that really compliments the scene. I'm currently waiting on orders of materials from several suppliers but will detail the construction of the bridge here when they all arrive. Adios for now! This past week I've been up to my elbows with the scenery in Geyser Gulch. 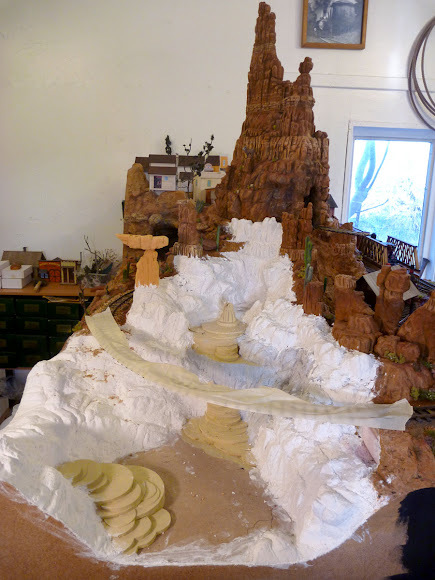 This is a major scene with the greatest vertical separation on the railroad; 33 inches or 132 scale feet from the bottom of the Gulch to the top of Baxter's Butte. Here are some in progress shots of the scene so far. This is the way things looked for quite awhile. Not much to see here but pink styrofoam. Adding the travertine terraces created by the geysers and hot springs. These are just foam-core and card-stock shapes. The copper tubing is for the erupting geysers. Rocks sculpted with Sculptamold. A new landmark has been added: "Ambush Rock" carved from Balsa Foam. 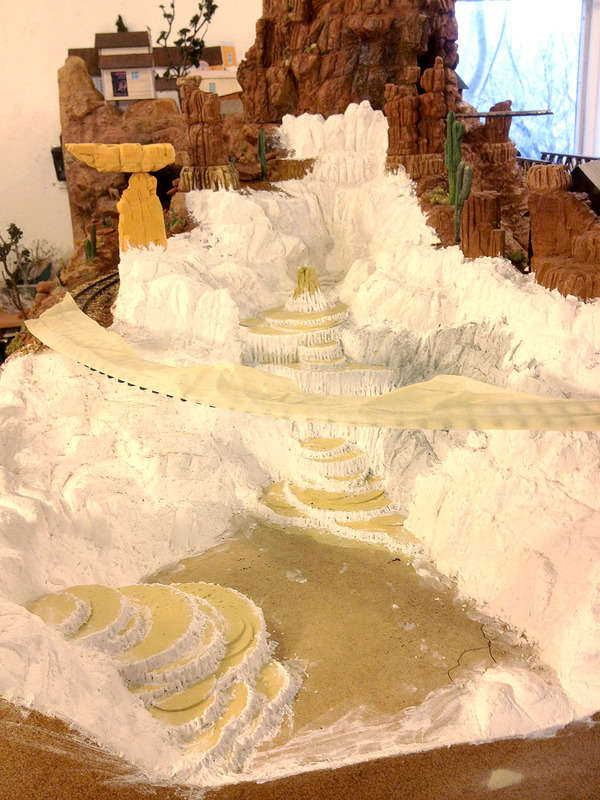 Here the travertine terraces have been shaped and detailed with Liquitex acrylic modeling paste. I let that dry overnight. Everything painted with artist's acrylics using my usual methods. The blue-green color is meant to be intense. The scene is meant to evoke Yellowstone's Mammoth Hot Springs and Grand Canyon's Havasupai. Next will come some ground cover, desert plants and other details. 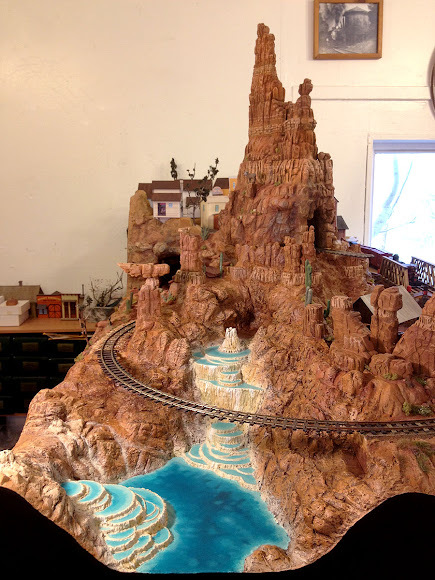 I also need to design and build a spindly wooden trestle before pouring the epoxy "water." After that it will be time to make those geysers operational with theatrical fog effects. Stay tuned! 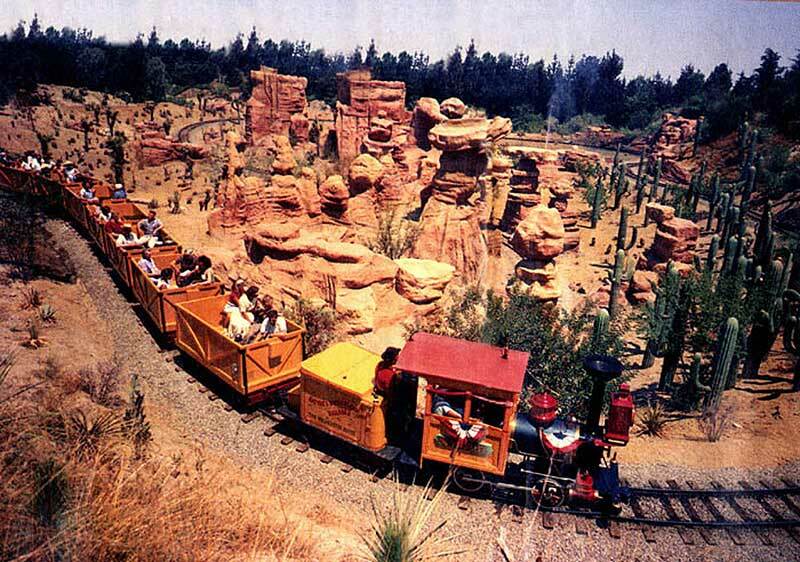 It was one year ago today that this site first went live, telling the story of the Thunder Mesa Mining Co. Though the layout itself is actually a little older, April 1st is as good a day as any to celebrate the "birthday" of the TMMC. Progress is coming along much more quickly now than it was in the beginning and I am thankful to all who continue to stop in for a look. There's still an awful lot to do but things are getting more interesting as the primary scenery construction is nearing completion. 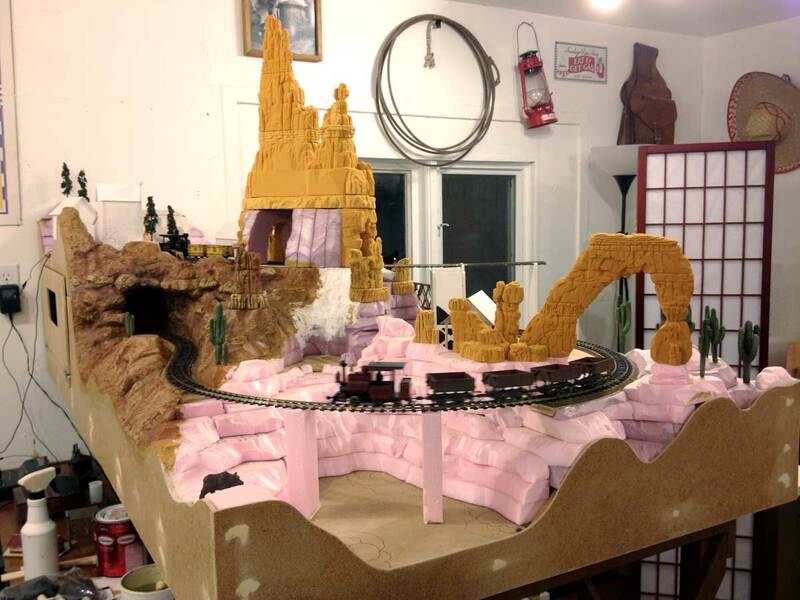 Here's a quick "before and after" to show how far the layout has come in the last year. Still lots to do in the coming year, hope you'll come along for the ride!